Nepenthes aristolochiodes was recently introduced into cultivation a few years ago. It is unique because of the position of the mouth opening. My particular plant has produced many basal side shoots. There are about four different growth points. I think this happens from tissue cultured plants more than from cuttings. For some reason it was available a few years back and has now disappeared from the market. This plant arrived very small and very dehydrated! There was a tear in the baggie and the plant was completely dried out with nothing but a few "hairs" for roots. I thought for sure it would die. The leaves were crispy green but I planted it up anyway. Not only did the plant bounce back, it's thriving! It has just begun to go into its vining stage. I think this species is one of the faster growing highlanders you can get. 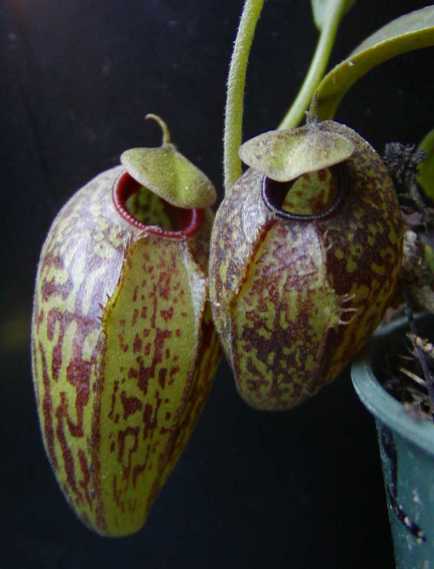 Recently some very unique hybrids have hit the market, usually from Exotica Plants, that involve crossing this species. All of them appear to be very unusual and in high demand! 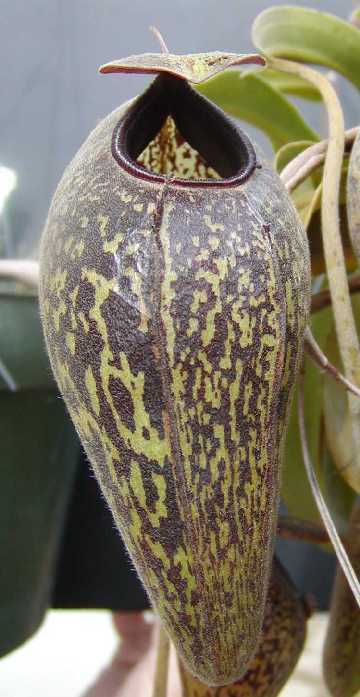 Because of its unique pitcher shape, this is a definite species for the collection. $ / size: expensive; $40.00 for size 2 plants and $60.00 + for larger plants.